As September winds to a close SuperData Research has released their digital revenue numbers for August, and the month saw quite a shake up in the status quo. This is only the third time since SuperData started publishing this set of monthly charts that League of Legends has not held the top spot in the PC column and it is the only time it has been lower than second place. 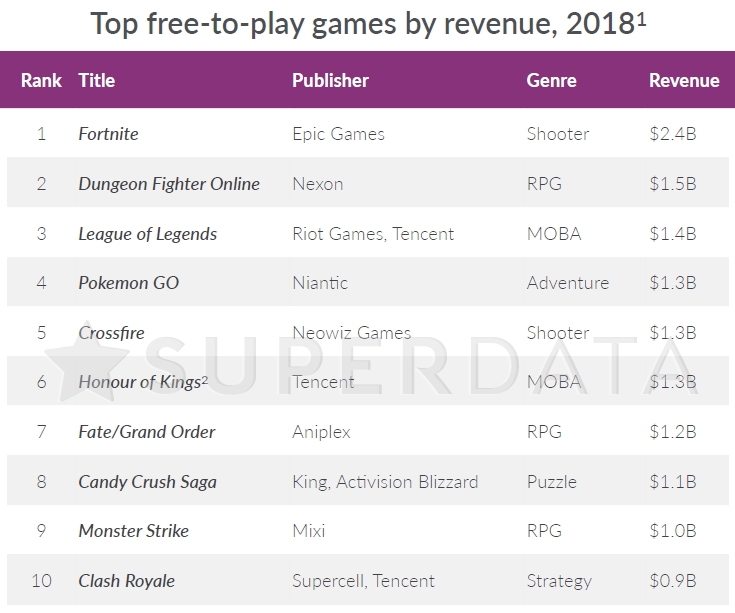 Last month Dungeon Fighter Online took the first place position from LoL. Not only did DFO hold that spot, but now World of Warcraft has come in and pushed LoL down another notch. Certainly, with the launch of the Battle for Azeroth expansion in August, it was expected that WoW would surge as last minute buyers grabbed the new content and resubscribed. But passing LoL is another thing, and it certainly brings into question the “WoW is dead” crowd. Of course, I do wonder how much this has to do with Riot Games, the studio responsible for LoL, and the toxic workplace revelations that have been showing up in the press, starting with the expose at Kotaku. LoL has long had a reputation for its horrible player base, but it appears that this is something of a reflection of how the company is run. As noted below, LoL is not having a good performing year and maybe its reign at the top of the chart is over. Then there was Monster Hunter: World which jumped onto the chart in the fourth place position, pushing Crossfire and Fantasy Westward Journey II, long staples of the top of the chart, down to fifth and sixth spots respectively. 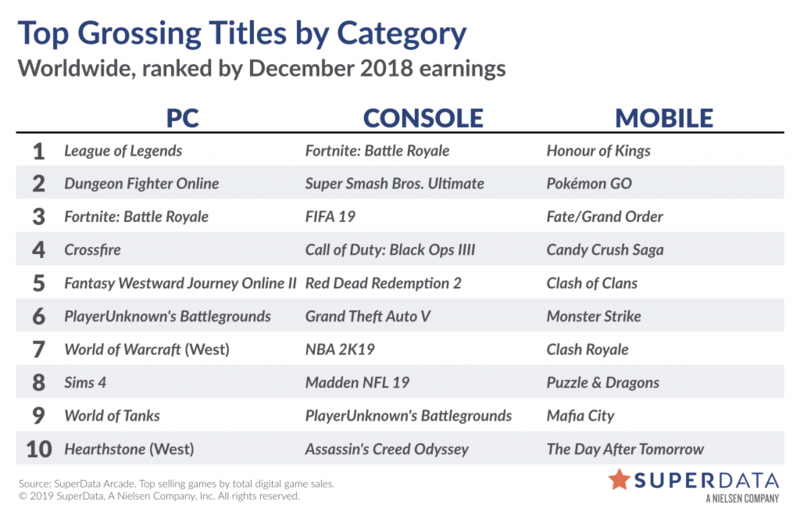 All of that put the battle royale games, Fortnite and PlayerUnknown’s Battlegrounds down to seventh and eight positions. Also popping up onto the chart was Hearthstone, which managed a ninth place entry, leaving the bottom of the stack to World of Tanks, which at least held on to its long streak onto the chart even if it dropped a couple spots. So this is why I like to track this chart every month. An individual month is cool but not all that informative. Trends over time though, reaction to events and launches and that sort of thing, that is the interesting bit for me. Even if you question SuperData’s data gathering techniques, even flawed data, gathered consistently over time, has value. On the console chart Fortnite held on to the first spot for another month and FIFA 18 returned in second and Grand Theft Auto V, long a staple of the console chart, stayed in third. Madden 19 debuted strong on the console chart while Overwatch returned to the chart, ringing in at eighth place, giving Blizzard another title on the overall report. And on the mobile chart the rankings was almost identical with the July chart, with Pokemon Go holding on to third. The only change was Clash of Clans and Candy Crush Saga which swapped positions, putting them at ninth and tenth respectively. 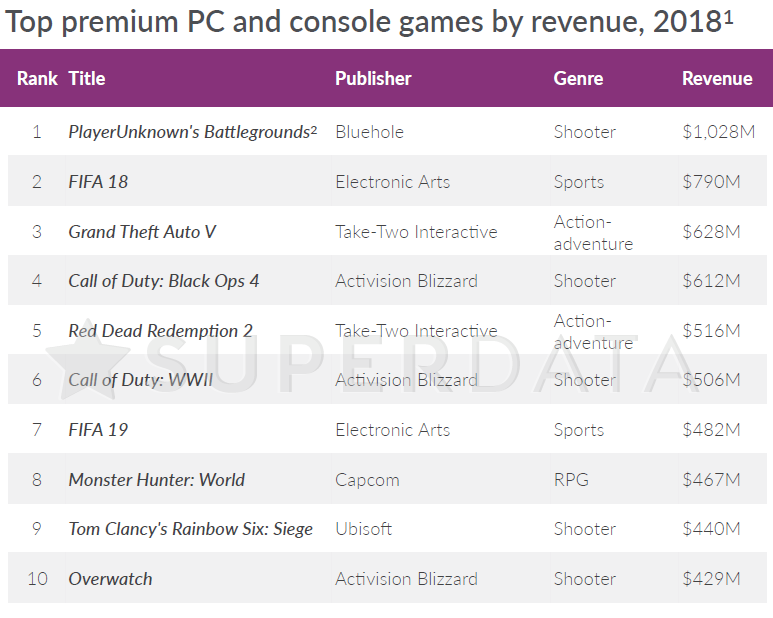 So kind an interesting chart at the PC end, but not much change on consoles and almost no change for the mobile end. It will be interesting to see if Blizz’s mount bribe will keep WoW high in the ranks for September and then if it will collapse because the core audience won’t have to pay again until March. Madden 19 sets new franchise launch record. We estimate Madden 19 sold 664K digital units on console. This easily made it the best ever launch month for the franchise, though sales benefited from an earlier release date this year. League of Legends heads towards its worst performing year since 2014. League of Legends revenue is down 21% compared to the same time period in 2017. Blizzard hits a home run with World of Warcraft expansion. World of Warcraft made $161M in August following the release of its “Battle of Azeroth” expansion, not including all pre-sales in the months leading up to launch. Subscribers for WoW West hit its highest point since 2014. Monster Hunter World sells 2M units on PC. Capcom’s action game had a successful launch on console earlier this year, and the PC version looks to be doing even better. 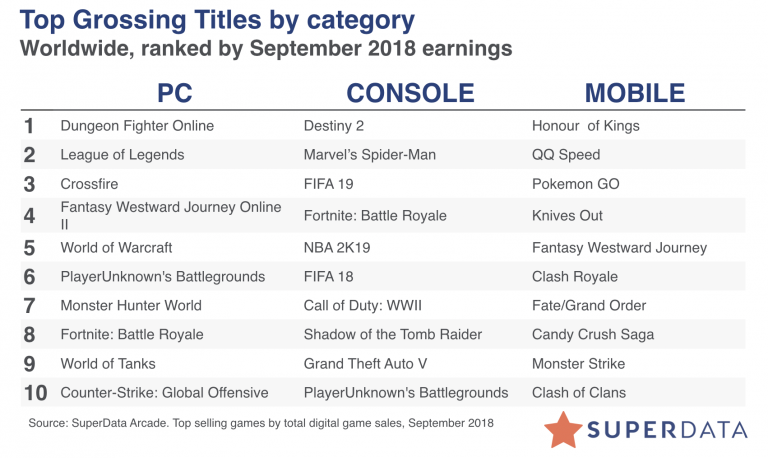 Monster Hunter World took first place in this month’s top grossing Premium PC rankings, knocking PlayerUnknown’s Battlegrounds down to second. This entry was posted in entertainment, SuperData Research, World of Warcraft and tagged Fortnite, League of Legends, PlayerUnknowns Battleground on September 27, 2018 by Wilhelm Arcturus. With the end of August at hand SuperData Research has their digital revenue numbers out for July. For only the second time since I have been covering this monthly update League of Legends is not in first place on the PC side of the house. The last time was back in March, when Dungeon Fighter Online overtook the dominant MOBA. As happened then, I am not sure if LoL sagged a bit in July, DFO saw a surge, or if the two are just close enough in general that this should happen more often. Certainly last year’s revenue summary from SuperData had LoL out in front by nearly half a billion dollars, but that could have changed. 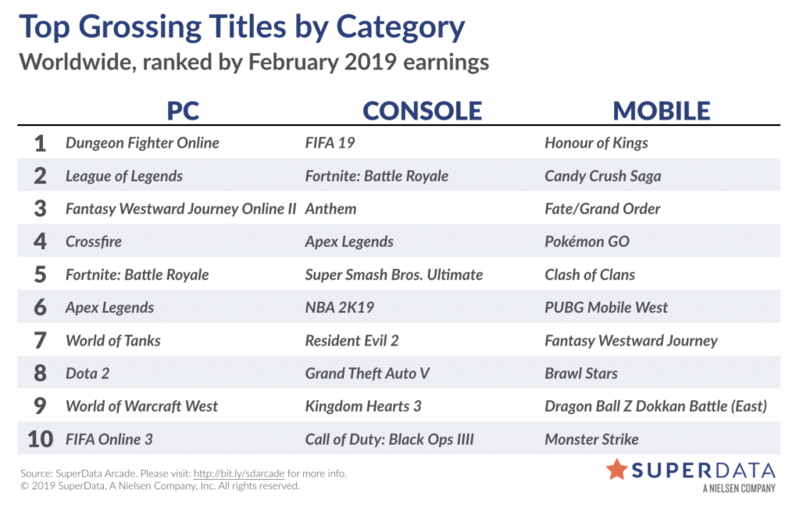 Otherwise the usual top four remain secure again at the top of the list as PlayerUnknown’s Battlegrounds, which disturbed the status quo by jumping into third place last month, fell back into sixth place behind its nemesis Fortnite. World of Warcraft held onto seventh place overall and World of Tanks held eighth again while DOTA 2 and CS:GO swapped spots from last month, leaving no newcomers on the chart for July. 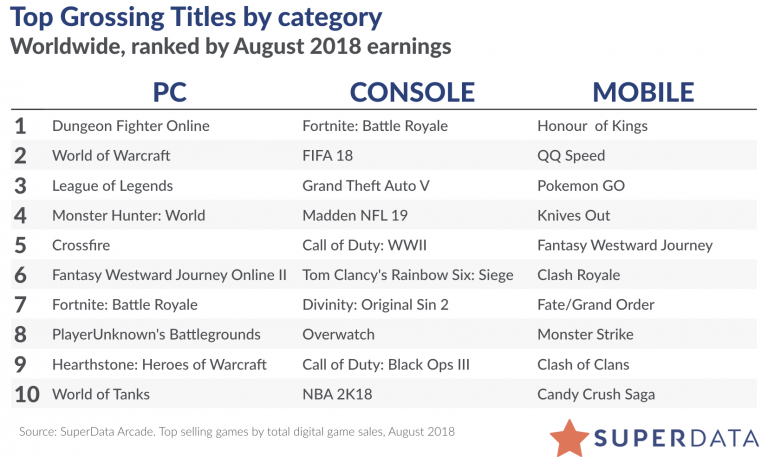 On the console chart Fornite held onto its top position, with FIFA 18 behind it in second again. GTA V had a new update which helped the five year old title roll back into third position. No Man’s Sky got some good press with its latest update as well as launching on XBox, helping it into an impressive sixth spot while Overwatch fell off the list for July. When it comes to mobile Honor of Kings stayed in its usual top position while Pokemon Go held onto the third rank spot it achieved last month. Candy Crush Saga, the perennial match three title on the list, stayed in eight position for the month. Fortnite’s peak may be behind us. 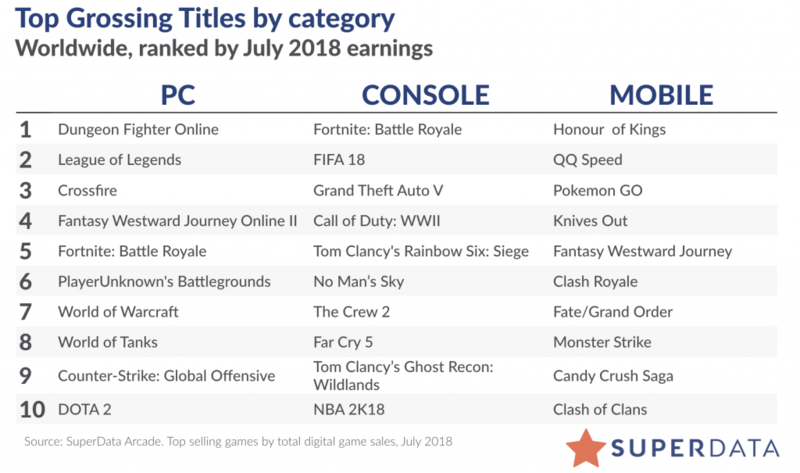 Fortnite revenue is up only 2% from June. Growth was modest despite Epic releasing Season 5 of the game’s battle pass midway through the month. No Man’s Sky has its best month since launch. No Man’s Sky generated an estimated $24 million across all platforms in July after releasing its much anticipated NEXT DLC and launching on Xbox One. Over two million players were active in July, a 10x increase from June. Overwatch revenue continues to slide despite consistent playerbase. Overwatch additional content sales across all platforms declined year-over-year and sequentially from June. On the other hand, monthly active users increased due to a free-to-play weekend and the release of a new playable Hero. Grand Theft Auto returns to form with “After Hours” update. We estimate GTA Online had its highest earning month of the year so far, and second only to December 2017 for highest month since launch. This entry was posted in entertainment, World of Warcraft and tagged Fortnite, League of Legends, PlayerUnknowns Battleground, Pokemon Go on August 26, 2018 by Wilhelm Arcturus. Honest Game Trailers already did a Fortnite video back at the start of the year, but that was before the game fully exploded across multiple platforms and put PUBG in the corner. So now they are back to cover what has happened since. I still haven’t given the game a try. At one point my daughter tried to play Fortnite on her aging iMac and found it ran about as fast as a PowerPoint presentation. I expect that she’ll be back to it with her new PC when school starts again and she wants to play what most of her friends are playing. This entry was posted in entertainment, Other PC Games, YouTube and tagged Fortnite, Honest Game Trailers on August 12, 2018 by Wilhelm Arcturus.